While it is not quite the flawless masterpiece its reputation would suggest, Through The Ages: A New Story of Civilization is still a great game and worth every one of the four stars we gave it. It’s a heavy game, demanding a lot of its players in terms of mastery and also just availability of time. 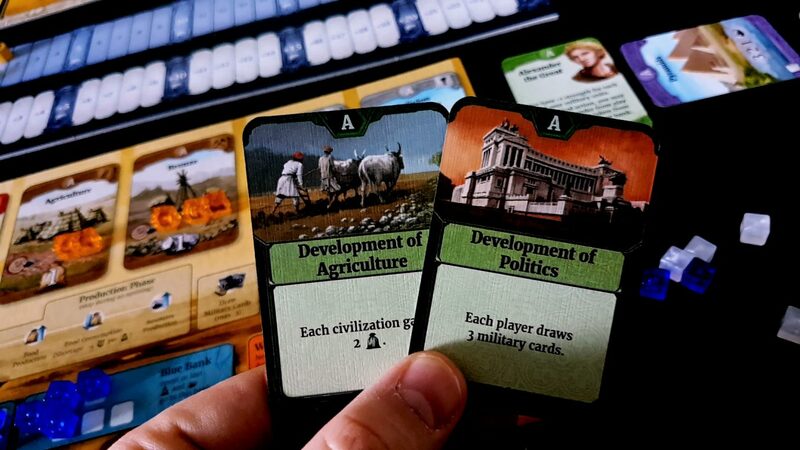 The question of whether its an accessible game is still for us to address so let’s construct the world wonder that is the Through The Ages Accessibiilty Teardown. Wow, that sounded pretty up myself didn’t it? Let’s not dwell on it. Dig in – we need to get right to the meat of the agriculture. Colour blindness is a problem but not an insurmountable one. For the most part your various coloured cubes are differentiated by the context of their placement – blue and yellow cubes will be on cards and the player board, and the white and red cubes that represent governmental actions will be on your government card. You won’t often be intermingling these cubes, and in most cases they’re going to be possible to tell apart anyway if they get mixed up. Usually though red and white go together as do blue and yellow. They don’t hang around much with each other outside of work. Even if they did, close inspection will reveal which is which. What makes this weird though is that they don’t come out of the box like this – you spend a good chunk of time attaching the various symbols to these from a sheet of stickers. That means the uniformity of the designs on each of these is entirely intentional – it would have been easy, without anything else changing in the production, for non-colour coded iconic information to be used to differentiate markers. Change the plus signs to something unique for each colour, as an example. Or, change the symbols to be something thematically different. 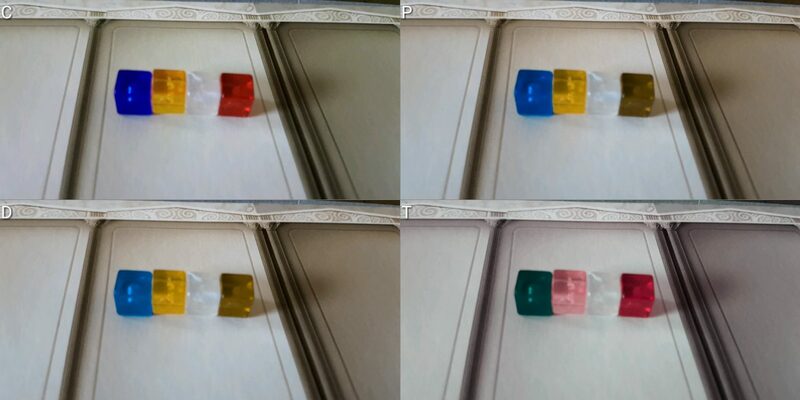 As you can see with what you get blue and yellow is problematic for Tritanopes, red, green and yellow for deuteranopes and the same but less so for Protanopes. Monochromatic vision will have a problem with all of these. 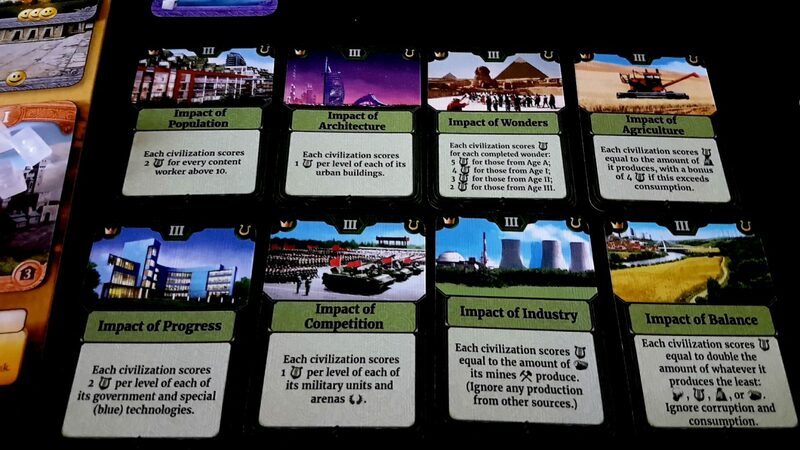 The only place these are used are in the score tracks, but there are a number of different tracks and it adds a considerable burden to checking how empires are progressing to every turn. 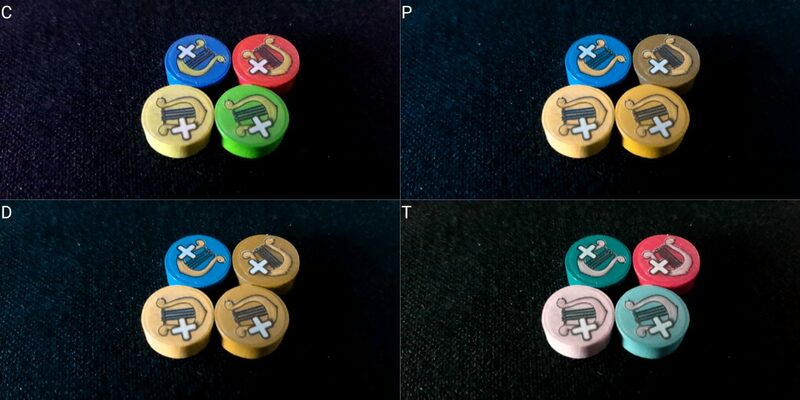 It does though only come into effect at higher player counts – two player games should be unaffected and it would be possible to substitute other tokens if three or four players must be accommodated. Another mitigating factor here is that it’s not critical for all players to be aware of all scoring for all players. Really what you’re interested in is their military tracker and their culture tracker. The other things are informative but not critical information since you can’t really do anything about them. Military has an impact turn to turn, and the culture output of an opponent shows when you should consider ramping up your own production. As long as those two can be clearly told apart the game impact of colour blindness is minimal. You could even resort to tracking these with a spreadsheet or sheet of paper. We’ll recommend, just, TtA in this category. There’s a lot of information to consider and sometimes it’s not very well contrasted. For those for whom total blindness must be considered we’d suggest TtA is all but totally unplayable without extensive support from the table. Much of the game state is open, but the elements that aren’t have considerable impact that doesn’t permit for ease of accessibility support. Players knowing what events you have seeded into the deck, for example, hugely hamstrings an individual’s ability to lay traps for others. For those with less severe visual impairments the situation is somewhat more complex. You have a player board which has numerous tactile elements on it that could be used to track game state but they’re not always possible to tell apart. On a building card for example a player might have blue cubes (resources) and yellow cubes (workers). They feel identical and so can’t serve as a way to fully offer a lens onto the state of play. However, it would be possible to substitute these to an extent with a little awkwardness. There are a lot of tokens (blue and yellow) that come from a central bank but only the ones that are actively in play need to be differentiated. The colour of others, provided the game state is explored with care, would be obvious based on where they are on the board. It wouldn’t be possible to track things like corruption and food consumption by feel, but the board could be modified with indentations to permit it. 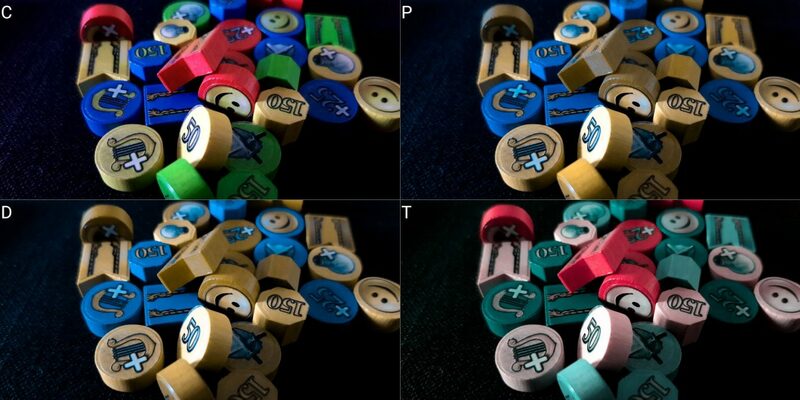 The player board in other words is simultaneously inaccessible but susceptible to modification to permit play by those with visual impairments. Even those with total blindness might find this part of the game tractable with some careful adjustments of the board. The main problem is that you’re also making use of a hidden hand of cards and as you might expect these cards are intended for use in a covert way. You rarely have too many of these because there is a strict hand-limit applied but the limit gets higher as the game goes on. Close inspection of a card with an accessibility aid would help here but only for those for whom some ability to read game state is possible. Some of the cards are very information dense, and their layout is not entirely consistent. Some contain information in corners or at the bottom based on the type of card they are. 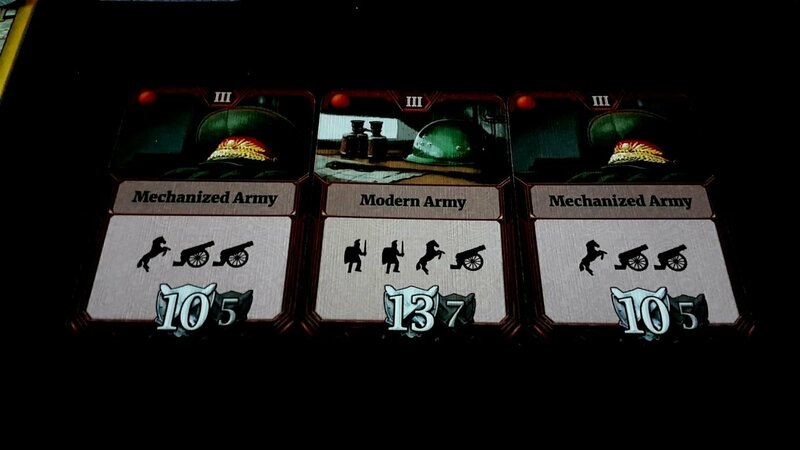 Tactics for example have military bonuses at the bottom as well as the icons needed in a military to achieve them. Events have information in a variety of iconic formats in the top right corner alongside the culture score that comes from playing them. Wars and aggressions contain often intricate text interleaved with icons to represent resources, and a military cost in the top left. The contrast on these is sometimes not ideal. The card row contains thirteen cards that are up for sale, and a player is going to have to make all their decisions with the card offering in mind – the civil actions they have to spend are going to do double duty here in terms of local actions on the player board and buying cards when it is timely from the row. Cards cycle frequently out of the row – in two player games you’ll lose the three on the leftmost side and in four the single leftmost card. Cards enter at the right side at an equivalent speed. The speed of churn is high because other players are also buying them. The state of other civilizations is useful information, but it’s not vital. You have limited ability to influence other players barring some event cards. Those event cards more than anything else will be based on relative military strength and culture production. You do occasionally make decisions on the basis of what someone has in their civilization but not often enough that it need be a major issue of ascertaining visual information. You might give off gameplay intention by inquiring about the state of someone’s empire (Hey, how many Age A wonders do you have just out of interest?) but there’s relatively little that can be done about it even if they correctly assess what it is you’re planning to do. They can just be aware of it. Their player board, which could be made more accessible with modifications. Their set of secret cards, which could be possible to make out with the use of an assistive aid. That is all you need to know for the most part. When the final scoring context comes around it becomes more important to know what other players have in their empires. Many of those cards are dependant on workers, buildings and the output of a civilization across many categories. At that stage it would be necessary for a player to inquire of others what they have played down but a solution to this could be house-ruled with open end-game scoring events. As such, I think TtA could be played with support from the table for those with moderate visual impairments. However, it’s also not necessarily something I would recommend given the churn of the card row and how much compensation is needed on the local board. We don’t recommend TtA in this category but if someone really wants to have a go it’s likely to be possible. This is a complex game, and a game with complicated rules full of conditions and caveats and ‘if this then that unless’ compounds. Everything about it is a problem in this category, from the short-term tactical considerations that go along with spending actions to the larger strategic elements of where a player’s focus should be and when that focus should shift. It’s possible through poor planning to end up in a situation where you’re at your hand limit and yet can’t spend any cards because you don’t meet any of the requirements. You need everything you do to align to a certain degree and if it doesn’t the whole system begins to collapse in a very frustrating way. The reading level required is high for event cards, especially those with the most interesting and subtle effects. That’s nothing compared to the numeracy required which is technically straightforward but complicated by the spatiality of resources. The value of a resource is not coupled to how many cubes you have, but which cube is assigned to which building. A blue cube might be worth three food or one ore – it just depends on where it is. As such you’re using blue cubes that have changing values that need cross-referenced against the card. It seems like the obvious solution here is to use more cubes – when you produce ore on an iron building then put down two cubes rather than one. That doesn’t work at all though because the different buildings don’t just represent output – they represent efficiency. Using fewer cubes for more resources is powerful because it means you are less impacted by corruption and waste in the system. As implied earlier, blue cubes also have a fungibility of meaning because they are both ore and food. They mechanics by which they make their way in and out of your bank is also something that needs carefully managed because it has significant implications for the way your economy works. Numeracy is also required for calculating upgrade costs (the difference between one building and another), situational effects in tactics (some tactics have lower effectiveness when units of an older age are assigned), and the movement of military, culture, score and science markers. Some cards offer discounts on certain actions on a permanent basis, some offer one-use discounts that must be used at the best time for maximum effect. The numeracy required here is considerable and often non-commutative. The order in which you do things is as important as doing them at all. With this comes a game state that starts off relatively complex and becomes increasingly so as time goes by. In addition, the complexity of the decisions you make regarding events and politics becomes ever more sophisticated as their effects become more intricate. The timing of events can’t be guaranteed and as such you also need to remember what events you layered into a deck so as to be prepared for their emergence. There are lots of token combinations, special synergies, and alternate systems for handling different kinds of cards. The rules for a war, for example, are different to the rules for an aggression. The process of dealing with colonisation is different from how you deal with a random event. Some of these incorporate new mechanisms – colonization introduces an auction system, the military has elements of set collection. It’s a lot for someone to keep track of. The game flow is consistent but what happens on a turn is influenced by events that have been played – some give bonuses that need to be taken and others apply penalties that happen after the political phase of a player has enacted. The action and outcome for some game actions is decoupled too – one example of this is that a war is resolved at the start of the aggressor’s next turn. Scoring seems simple from the tracker but is done in all kinds of odd ways – it accumulates from buildings, from the playing of events, but also in great chunks from the playing of later age wonders and score cards. Some of these are sophisticated and require calculation of their own to work out whether or not they’re worth playing. Like all events, playing these well is an act of timing but It’s also of knowing if you want a scoring event to trigger at all. You might want to discard it entirely if it’s only going to put you farther behind in the culture track. Importantly, this is also a game where it helps a lot to know the deck composition of the ages and what cards are going to make their way down the row. Like Twilight Struggle, this has a massively impactful effect on the game as a whole and puts a considerable burden on the memory faculties of all players. Those that know the decks well will crush those that don’t, especially those that can marry their knowledge of deck composition to the evolution of their civilization. This is especially true when it comes to the heavily scoring Age III events which are contingent on the internal composition and outputs of civilizations. We strongly recommend players with cognitive impairments in either category avoid Through the Ages. 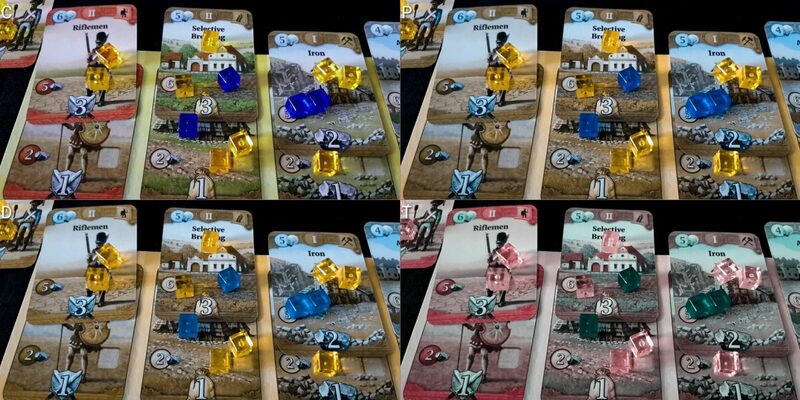 While a lot of the competition in Through the Ages is mediated through the card row, there are also many opportunities for players to directly target each other. The war and aggression cards require the selection of a target, and many events have an impact that is broadly predictable even if it’s not necessarily possible to guarantee. The game incentivises picking on a weaker target too because in a war it’s the difference between militaries that is used to calculate plunder, and for aggression the impact is an absolute value rather than a relative one. A card might let you steal seven culture from a player with a weaker military, and It’s seven you get to steal whether they have seven or seventy. This can lead to a cycle of what is effectively bullying – as you knock a player back they become an ever more lucrative target for others who can prey on their opponent without risk. If you steal five ore from someone they’re less likely to be able to build up their military to repel the next attack. There’s no player elimination, but there are certainly moments where players can be encouraged to make use of the game’s resign option to remove themselves from the rest of the session. Sometimes these events will result in buildings being destroyed, colonies being removed, wonders crumbling to ruins, and so on. Sometimes the events have no upside, so they are literally being played on everyone with the hope that the player least impacted was the one that played it. To be fair there are also pacts and treaties that can be played but the game is skewed somewhat to permitting and incentivising ganging up on the weakest civilization. Events span the range of ‘nice for everyone’ to ‘haha, take that’ and back again. Playing an event of your own will trigger an event that was placed earlier, and so the effect is that by engaging in politics you run the risk of setting yourself up for ruin. This in turn can disincentivise players from engaging in politics when they have fallen behind, and this creates an asymmetry of influence in the game’s outcomes. Score disparities as such can be significant, especially in the later rounds when it turns out that it’s only lightly related to how well you’ve played the game for the rest of the session. You might go from winning comfortably to losing by a considerable margin by the time the final few scoring rounds come along. While it’s not always something you can prevent given the momentum of play it’s always something that can be anticipated if you know the decks well enough. The winning to losing differential can be tight between well matched players. It can also be in the region of a hundred of more points when players are not well matched, and that can sting especially since some actions can steal points directly from one player and transfer them to another. In games with more than two players, pacts and treaties come into play which allow formal arrangements where another is excluded – there are no military alliances that permit two players to attack a third, but there are certainly ongoing effects that would encourage two participants to focus their aggression on someone not in the ‘in crowd’. This would ensure that two players profit directly from the exclusion of a third. There is a variant in the rules that helps to mitigate against the aggression but in the end you sacrifice so much of the interaction that you’re playing a substantively different and weaker game. Competition over cards can be intense and valuable technologies can appear and be claimed before another player has a chance to get them. For most cards this isn’t a major problem but for governments in particular it can have a very corrosive impact on how much fun players get to have. The player with eight civil actions gets to do twice as much as the player with four. Not everyone is going to get an equal chance to play, and this means that there’s a system of positive reinforcement. Leaders can continually outpace those that have fallen foul of the game mechanics. In equally matched games this isn’t likely to be a regular problem but it can manifest through the sheer serendipity of randomness. Downtime is considerable and the problem here is that it often comes with an inevitability of outcome. When you see someone suddenly buffing up their military after you played an event card that was supposed to benefit you there’s nothing you can do about it except watch your plans dashed in front of you. If someone decides to launch an aggressive action at you all you can do in response is discard cards from your hand – unlike wars, you don’t get a chance to prepare. Sometimes you spend a long period of time just waiting for the horrible thing that happened to you earlier to actually take effect, and that can be infuriating. We don’t recommend Through the Ages in this category. There’s not a lot of physical manipulation required of the game that couldn’t be handled by a second party, but the management of cubes in the player board is likely to be an issue with regards to fine-grained motor control. You have a lot of cubes, all nestled into their allocated spaces on the board, and the configuration of these matters. As they’re used up they’ll start to reveal corruption and consumption effects that need to be taken into account. They just nestle on the board too – one jerk of the hand can send a whole empire into anarchy. This even extends to which card a cube is placed on – it might be the difference between generating one resource and three. When you upgrade a building it doesn’t take effect across your empire. You might have people spread across each and every one of your upgraded buildings producing different amounts of resources for each. The constraints on the cards are reasonably generous, but the spaces put aside for the yellow and blue token banks are much less so. You’re manipulating cubes in tightly cramped constraints. 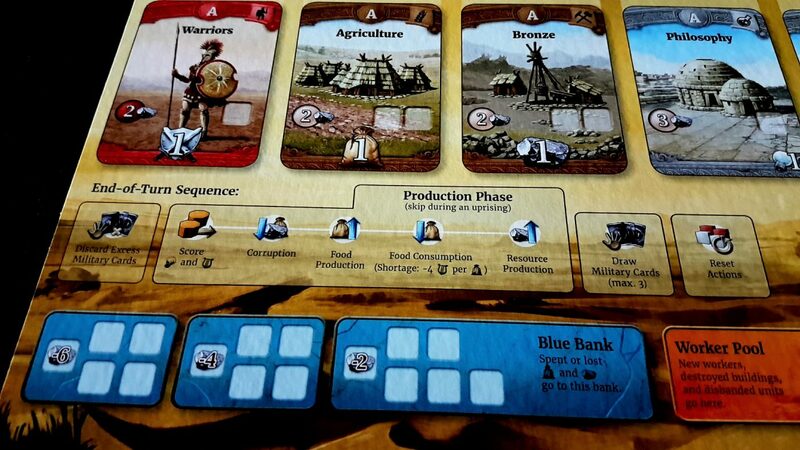 The player board also tends to sprawl because you’ll likely develop new technologies, military units and wonders – these all are placed to the side of the board and need to stack up. You need to hold a hidden hand of cards, and these are quite small. The number of these you hold is going to be based on the number of military actions permitted by your government. Some events apply a temporary influx of cards, as do some colonisation actions, and on occasion your hand limit will be stretched considerably as a result – this is only temporary until your next discard but it can be cumbersome given how information dense some of these might be. A card holder can be used to help deal with this but sometimes key information is on the bottom of cards and so an opaque holder might obscure key elements. 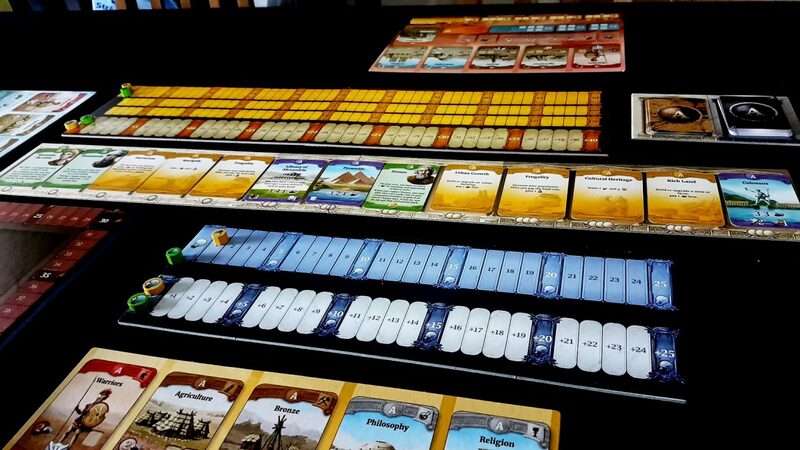 Selecting and cascading cards down the card row and moving counters around the various score tracks are the only other real set of physical activities required and these can be dealt with by the table as a whole. The cards you hold as part of your civic arrangement can be played as open knowledge since everyone sees you take them. Verbalisation is possible, but it’s made a little more complex by the fact you’ll often just be mulling over options. You have cubes for each civil and military action and it helps to be able to explore the possibility space of your turn before you commit to anything. As such, a player acting on behalf of another may have quite a lot to do in this, including resetting the game state back to the way it was. All of the actions are describable, and there’s no ambiguity in how things should be resolved. There’s just a lot of back and forth that goes into working out what someone might want to do with their meagre allowance of actions. We’ll tentatively recommend TtA in this category. There’s nothing in it that would prohibit play, but also a lot that would get in the way. Four guys on the cover. Not only that, four guys from a European background. In a game like this there’s really no excuse. It betrays such an aggressively Eurocentric view of history that inhabits each part of the game both in terms of its representation and the actual things it chooses to view as historically relevant. Of the twenty-four leaders available in the game, only one is a woman – Joan of Arc. Were the game tightly coupled to the specifics of the characters that would be one thing, but these are largely passive buffs given a quick paint job of theme. The criteria for inclusion too seems to be less than serious. Sid Meier is there, as is Bill Gates. Charlie Chaplin is in there. Indeed, if you look at the full roster, only four come from non European/American backgrounds. History in TtA is very much the province of white men. White history month. Year. Millenium. And it’s such a missed opportunity because there is so much to draw from here. A game like this should be international in its scope, and it doesn’t even need to ‘pander’ to accomplish it. The theme begs for a geopolitical context. There are so many inspiring women in history, so many great people from all kinds of cultures, and almost infinite scope for intersections of these groups. 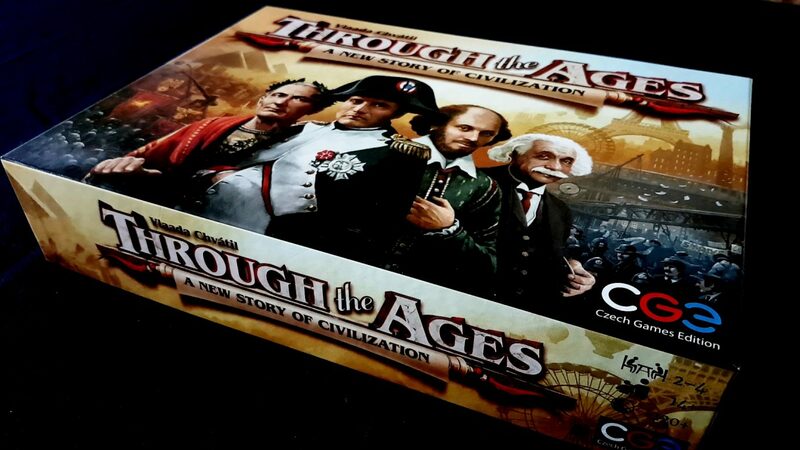 Through the Ages has an RRP of around £48 and that’s on the high side for something that is so situational. It works reasonably well at all player counts but the expected play-time balloons with each person. It’s not a game for novices or players of mixed ability. Really this is a game you play once and leave the table baffled. You play it twice and feel like you get a handle on it. After three plays you might know if you like it or not. Across the tabletop and app I have played this easily a hundred times, perhaps more – I still wouldn’t want to teach it to another person. As such, you make an investment in this game that is considerably out of scope for what might be expected of an evening. With four players you’ll likely need four or five hours – perhaps more if accessibility compensations need to be considered. That doesn’t fit neatly into a lot of lives. Like Twilight Imperium and other such grand and grandiose games, this might end up on the shelves simply because of the logistics involved in arranging a group. There is a need for some quite sophisticated literacy, but no other formal need for communication. Provided you’re not playing the game in an unfamiliar language we recommend Through the Ages in this category. Not a lot to talk about here – for those for whom there is an intersection of physical impairment and communication impairment, we’d suggest you avoid the game since the constant revision of action will become intensely burdensome even if you can arrive at an effective regime for instruction. The only other category in which we recommend the game is colour blindness and there are no intersectional effects here that wouldn’t already be covered by the core recommendations in individual categories. The most significant issue across the board in this section though is the playtime which is considerable, and the downtime which is brutal. The amount of planning and consideration and revision and reordering that goes into a turn of the game is likely to leave players spending long periods of time with nothing to do. Combined with an estimated duration of an hour per player plus an hour plus whatever you need for accessibility support this is one of those games that is long enough to exacerbate issues of discomfort. Long enough, in fact, to be responsible for causing issues of distress or discomfort. 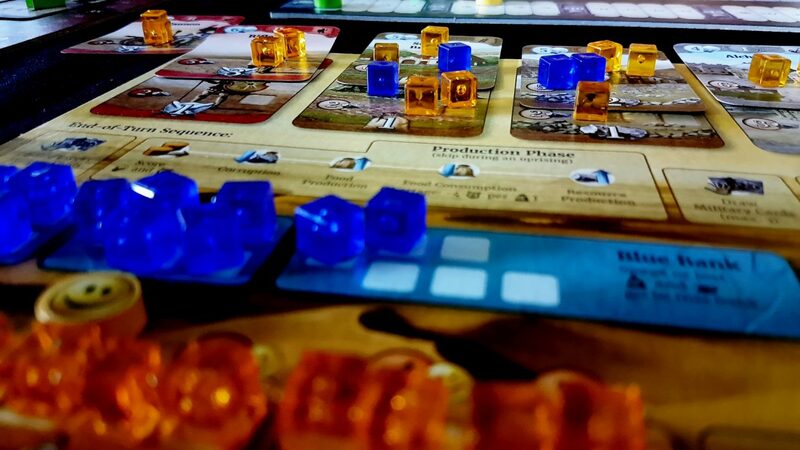 Through the Ages does come with a resignation mechanism, which is nice – the game is sufficiently robust that it can cope formally with players dropping out of play. There is no corresponding mechanism for returning to play. As admirable as Through the Ages is in terms of its game design, it’s a proper calamity in its accessibility profile. Not the worst we’ve looked at to date, but certainly a poor enough performance than I couldn’t in all good conscience recommend it to many people. It’s a shame because TtA has a grand reputation and that alone could make people interested in giving it a try. Oddly, despite the amount of information presented in play there are opportunities here for improvement. More tactility in cubes would help with visual impairment. Indentations or slots for cubes could help with displacement in cases of those with physical impairments. Even something like team based modes could be brought in to aid with the fluid intelligence accessibility issues. I wouldn’t imagine it could ever be an easy sell for a teardown, but there’s scope for it to do meaningfully better in a number of these categories. Even just looking outside the parochial cultural myopia that characterises its conception of history would do wonders here. 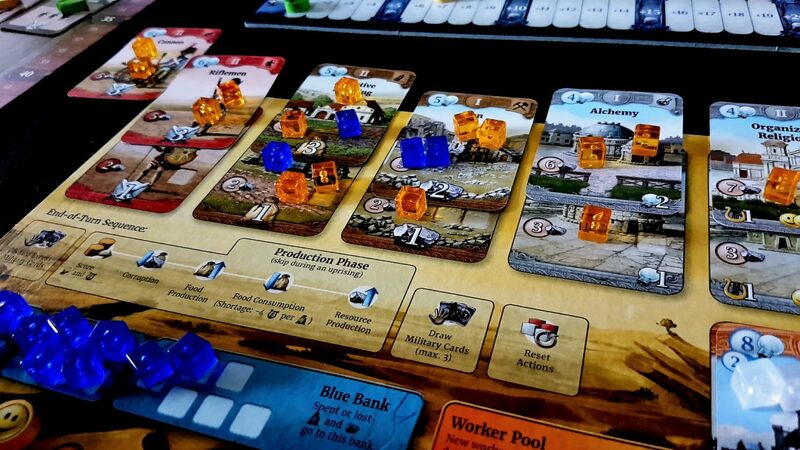 We gave Through the Ages four stars in our review – it’s a great game that is worthy of your time but it’s an unusually poor prospect in terms of its accessibility. It seems unlikely that many people would be able to meaningfully enjoy it if this is a consideration but if you’re one of them you could do worse than checking it out.